A DESCRIPTION: East Coast Swing is frequently referred to as Triple Step swing due to the rhythm of the basic triple step. East Coast Swing consists of six and eight count patterns, which require a rock step back by both man and woman. It is a circular dance that is danced with a bounce and is very grounded and not high in the legs. This bounce requires the dancer to stay very smooth and not jump around much. East Coast Swing is one of 8 country Western dances sanctioned by the UCWDC (United Country Western Dance Council) who describes East Coast Swing as a "stationary dance that uses rotary patterns and is performed with semi-cuban [motion], emphasizing downward compression." GET A FREE EAST COAST SWING DANCE LESSON! We'd love to share our passion for east coast swing dancing with you. Your first private east coast swing dance lesson is FREE! Singles or couples welcome (no partner necessary). 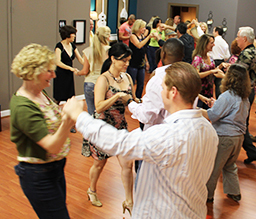 A free private east coast swing dance lesson is the best way to meet the teachers, see the dance studio and get an idea of what learning east coast swing dancing in Houston is like. Call (713) 259-4162, or SCHEDULE ONLINE! © Anthony Lewis Dance offers East Coast Swing Dance Lessons Houston TX. If you are interested in east coast swing dancing in Houston, call (713) 259-4162 now for free east coast swing dance lessons Houston TX.